In this guide, we're going to show you.. how you can setup a fully automated training package, and automate the entire client onboarding process. Now, what do we really mean when we say we are going to automate the onboarding process? Does that mean clients would have a self-service portal for signing themselves up? Or does that mean they can start their workout, as soon as they sign up? 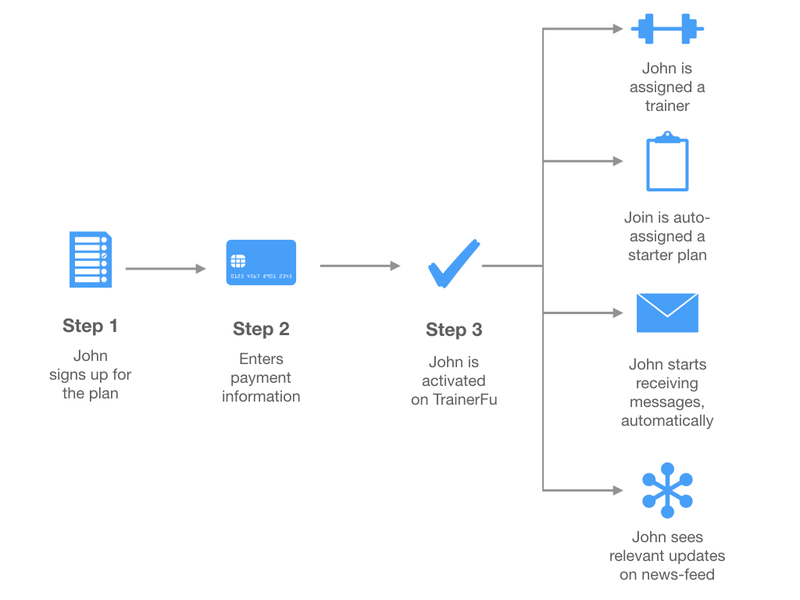 When programmed using TrainerFu packages, only the first two steps need to be completed by John (signup + payment) using a simple form. 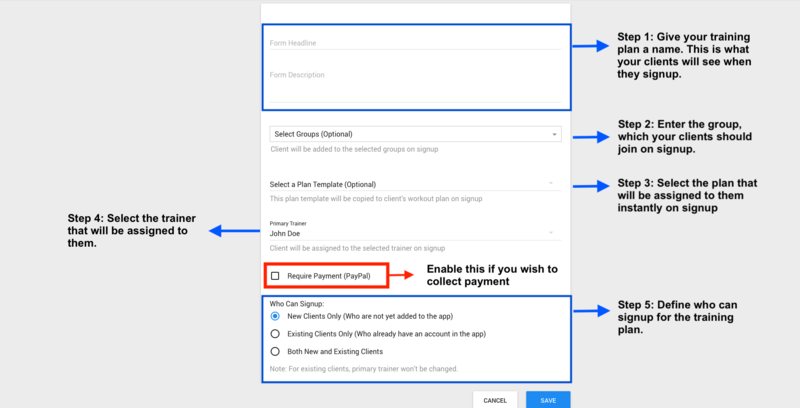 But, once the payment is processed, the entire workflow that's shown on the right side (assigning trainer, plan, group, etc.) can be automated using TrainerFu packages. So, for instance, if John signs up for a 4-week fat-loss program, all he needs to do is... put in his information and link his credit card, and that's it. He'll be automatically assigned a workout plan (using plan-templates); he'll be welcomed with an onboarding message (using auto-messages), and he'll start getting updates that you share with your clients (using groups & news-feed). In other words, training packages free you from the hassle of onboarding clients manually, while also streamlining how personal training experiences are delivered to your clients. 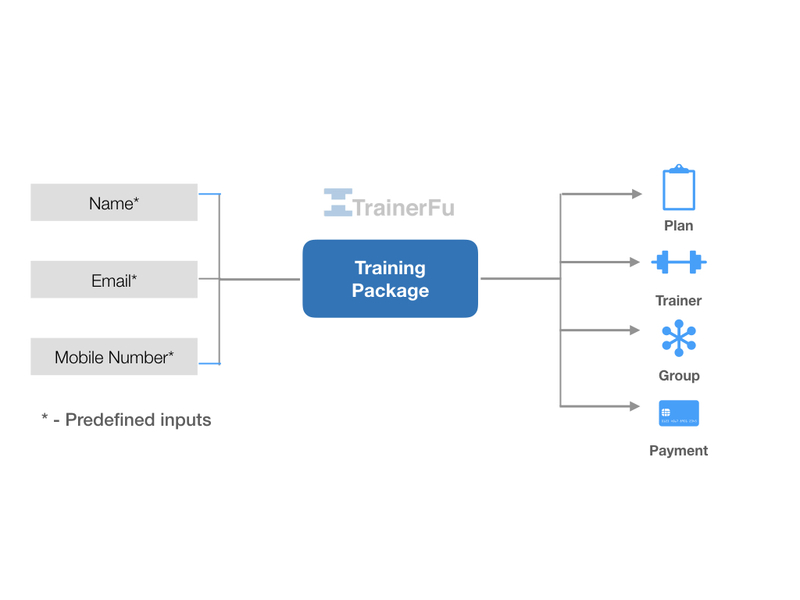 As shown in the above diagram, with TrainerFu packages, the basic client information that you want to capture is fixed (name, email, phone-number) and you don't need to configure those input fields. However, what you do need to configure for each package is how the onboarding process will work for each new client that signs up for that package. - Which workout plan should a client be assigned? - If you're running a multi-trainer gym, who's going to be training them? - Which group should be assigned to them by default? - And most importantly, how do you wish to charge your clients (one-time/recurring)? That's exactly what we are going to do in the setup process. Create a training group: The first step is to create a training group for your clients. Ideally, you should give it the same name as the plan that you're selling. For example, if you're selling a fat-loss program, create a group named "Fat-Loss". Configure a plan template: Next, create a multi-week plan template that will have all the exercises that you want your clients to complete in their first few weeks of training. For example, if you're setting up an endurance plan, you can create a plan template with 2-3 weeks of initial training. Schedule auto-messages: After you've setup a plan template, create an auto-messaging sequence for the group that you just defined. You can set messages for triggers, like, "1 Day After account creation", "1 Day After joining Group", "After completing 1st workout", "After not logging workout for 7 days", and so on. For example, if you're selling a 4-week fitness challenge, you can create a drip-message campaign, so that your leads will automatically get the messages from you when they signup, log their first workout, and so on. While the step is optional, we recommend not skipping it, as it helps in making client training experiences more personalised and engaging. Create trainer account: If you're running a multi-trainer facility, you might want to create different accounts for all fitness trainers in your gym, and then assign the package to the trainer that's going to be training the clients that you onboard. Setup the training package: The final step is setting up the actual training package. Here's a step-by-step process on how to set it up. Step 1: Give your training package a name and description. This is what your clients will see, when they signup. We recommend being as specific as possible with the training package name, so that your clients have a clear understanding of what they will get when they signup. If you're going to charge for the training plan, we recommend mentioning the payment schedule in the package description. Step 2: Next, select the group that will be assigned to client when they signup for this training package. Step 3: Select the plan template that you just created for your training plan. Step 4: Next, if you're running a multi-trainer facility, you can select the trainer that'll be training the clients that signup for the package. Step 6: Lastly, select who can signup for the training package that you just defined. You can either make the training plan exclusive to new clients, or you can even allow signups from existing clients (depending on your use-case). When you're done, click on "Save" to get the package link that you can share with your clients or embed on your website. Instant onboarding: You can onboard a new client and get them instantly started with their personal training by automatically assigning them the right plan, trainer & group, as per the training package that they selected on signup. Integrated setup: No need to use tens of different software to create an onboarding workflow. You can link the form on your website, social media page, or even share it with your clients via popular messaging platforms (WhatsApp, Messenger, Instagram, etc.). Recurring payments: Forget following up with clients on weekly or monthly payments. You can configure the payment behaviour in your training package to automatically charge your clients till their membership expires.